Ideal for proposals and manuals. Cover folds back to form a landscape format easel for presentations. Includes eight three-hole punched, clear sheet protectors. Holds unpunched sheets up to 11 x 8-1/2. Ideal for proposals and manuals. 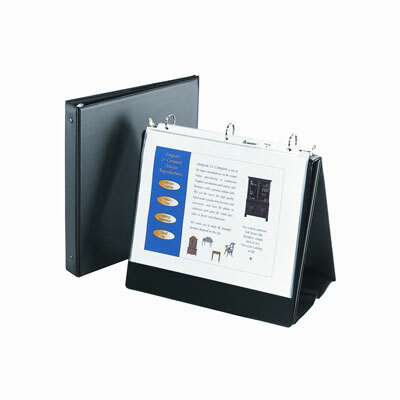 Cover folds back to form a landscape format easel for presentations. Includes eight three-hole punched, clear sheet protectors. Holds unpunched sheets up to 11 x 8-1/2. 1" capacity.